CNBLUE SPECIAL FANMEETING <BOICE CAFE>를 개최합니다. 3회의 <BOICE CAFE> 선 예매가 가능합니다. 일자 및 티켓 관련 구체적 사항은 곧 공지 예정이오니 조금만 기다려주시기 바랍니다. 예매를 원하시는 분들은 아래의 공지를 내용을 확인하여 주시기 바랍니다. *** 공지 및 행사는 추후 진행 상황에 따라 변경 및 취소 될 수 있습니다. BOICE 여러분의 많은 관심과 참여 부탁드립니다. 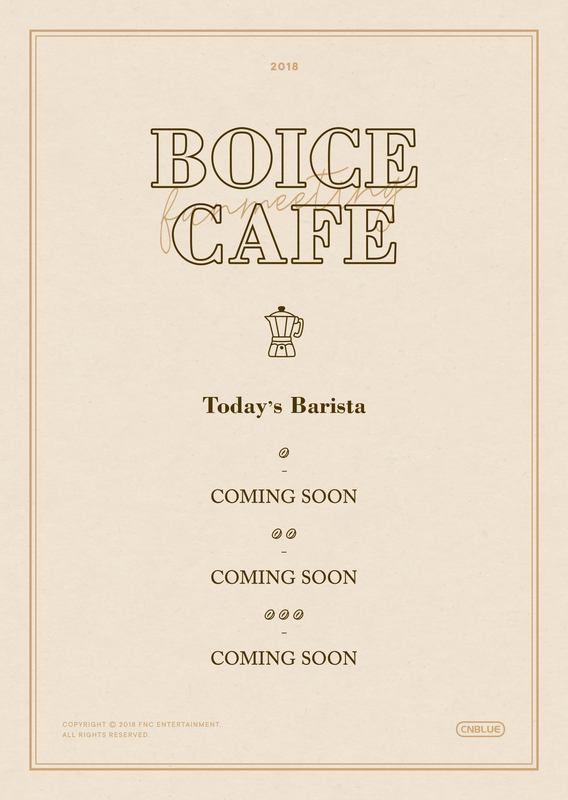 CNBLUE SPECIAL FANMEETING <BOICE CAFE> will be held. It will be a member’s solo Fan Meeting and pre-purchase tickets for 3 shows will be available to those who joined as Fan Club during registration period. The details on the dates and ticket information will be announced shortly. *** Please be noted that the announcement and the event may change or cancel due to unforeseen circumstances. BOICE, Please show your interest and support.